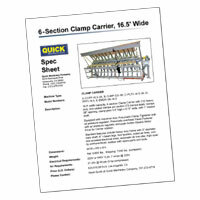 The QUICK 6-Section Heavy Duty Clamp Carrier is our most affordable Heavy Duty Clamp Carrier. 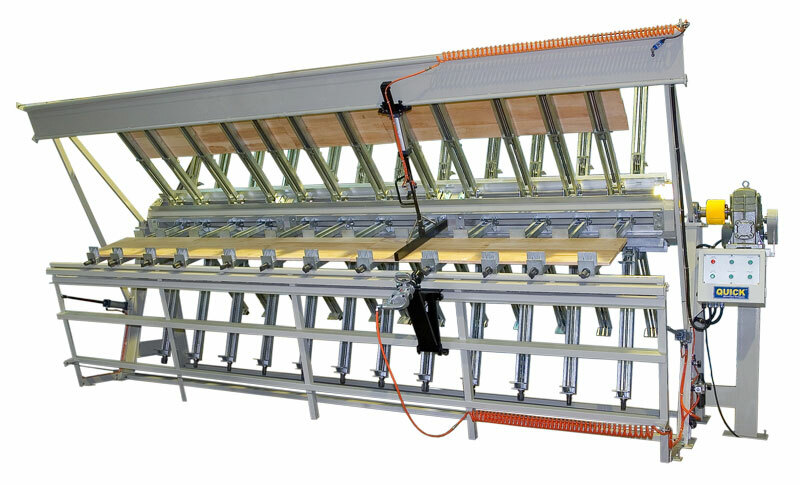 Capable of producing 144 edge-glued panels per shift (3 panels per section x 6 sections x 8 hours), the 8.5' wide, 6-Section Clamp Carrier (our most popular configuration) is ideal for the smaller cabinet or furniture shop. 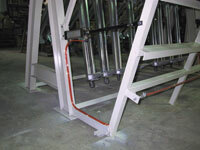 To view a high-resolution photograph of a 6-Section Heavy Duty Clamp Carrier, please click on the image to the left. 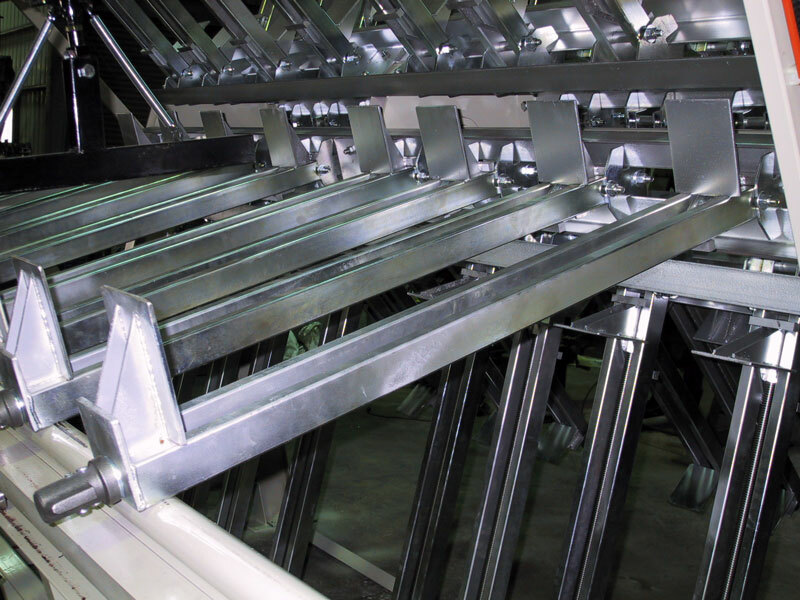 QUICK 6-Section Heavy Duty Clamp Carriers are available in widths (maximum stock length capacities) of either 6.5', 8.5', 10.5', 16.5' or 20.5'. 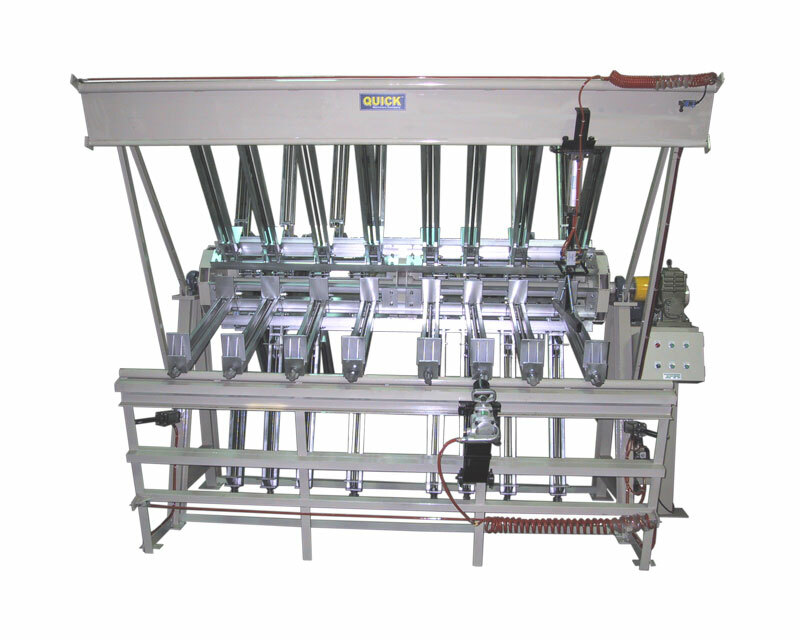 The 16.5' and 20.5' wide machines are ideal for gluing long material, such as 16' or 20' long moulding or handrail. 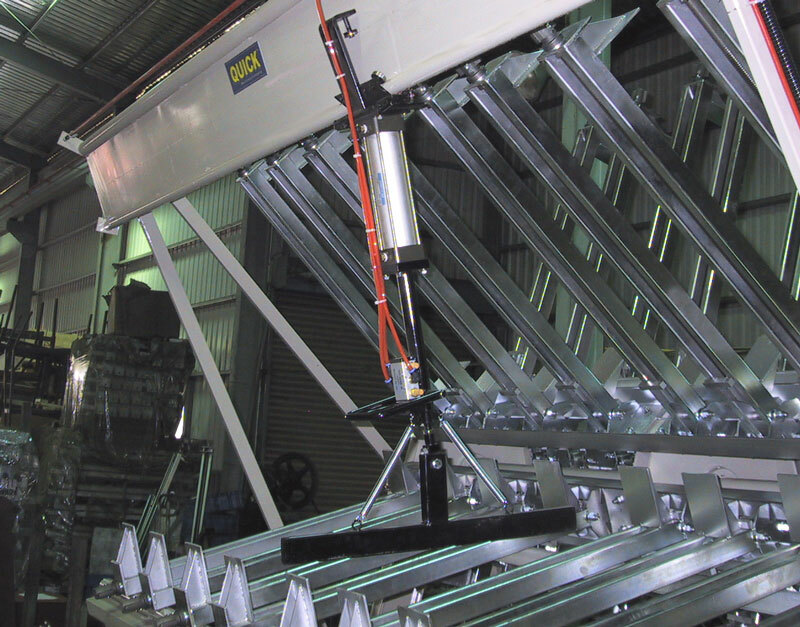 To view a high-resolution photograph of a 16.5' wide, 6-Section Heavy Duty Clamp Carrier, please click on the image to the left. Our 6-Section Heavy Duty Clamp Carrier has a very sturdy frame, with 2" main shaft (3" main shaft on the 16.5' and 20.5' wide machines) and 6" I-beam legs. To view high-resolution photographs of a 6-Section Heavy Duty Clamp Carrier, please click on the images to the left. 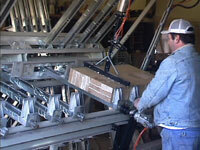 The 6-section Heavy Duty Clamp Carrier uses our Heavy Duty clamps, with 4-3/4" wide by 3-1/2" high jaws. 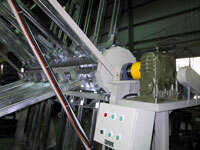 For complete clamp details, please see our Competitive Advantages page. 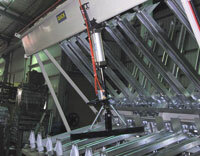 The machine shown in the photograph at left has our special 6" high-jaw clamps, for making high-quality posts and beams. 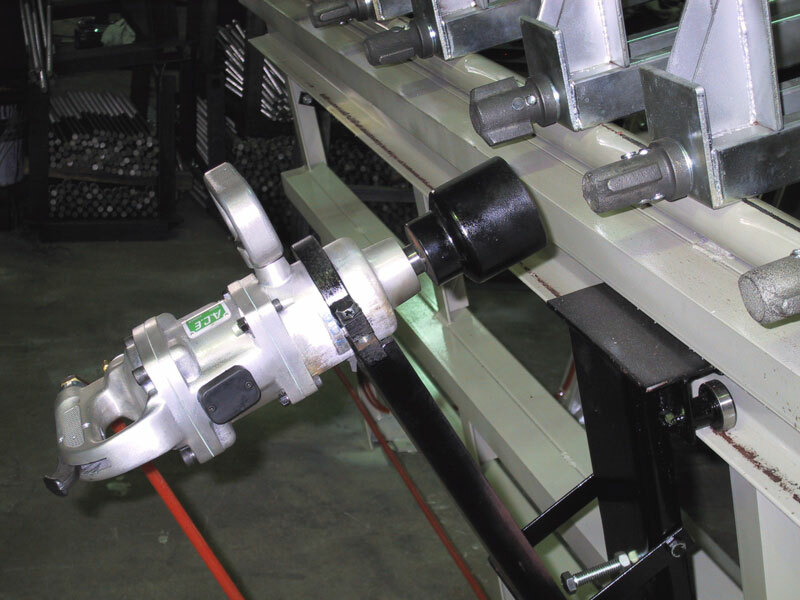 To view a high-resolution photograph of these 6" high-jaw clamps mounted on a 6-section Heavy Duty Clamp Carrier, please click on the image to the left. 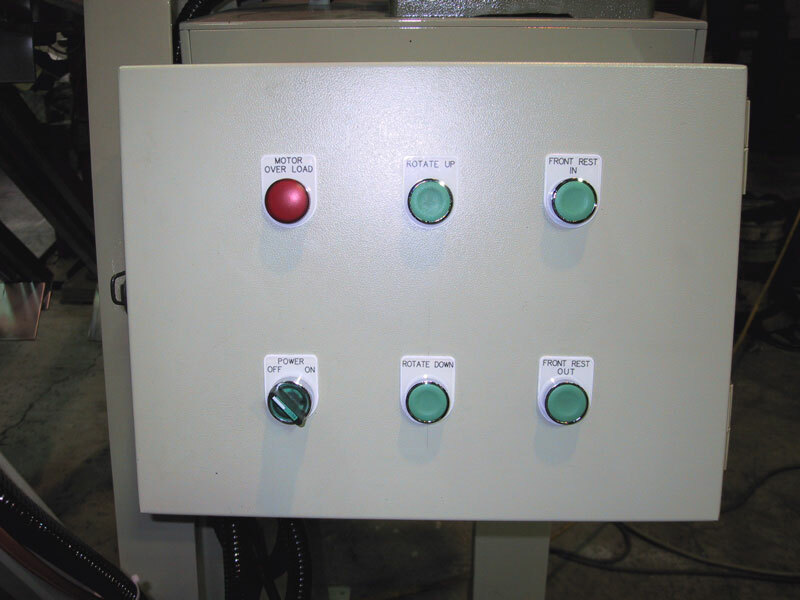 The 6-section Heavy Duty Clamp Carrier's Electric Motor Drive is operated by pressing 4 buttons on the machine's Control Box (see photo at bottom left). 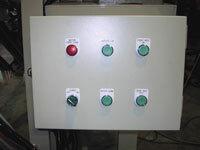 It does not have the Automatic Rotation feature. To view high-resolution photographs of these accessories, please click on the images to the left. To view a movie of our 8.5' wide, 6-Section Heavy Duty Clamp Carrier with Pneumatic Clamp Tightener in operation, please click on the image to the left. To view a movie of our 16.5' wide, 6-Section Heavy Duty Clamp Carrier with Pneumatic Clamp Tightener in operation, please click on the image to the left. 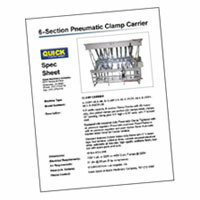 To download a PDF version of our 8.5' wide, 6-Section Heavy Duty Pneumatic Clamp Carrier Spec Sheet (1 mb), which includes specifications, electrical and air requirements, dimensions and example pricing, please click on the image to the left. You will need Adobe PDF Reader version 4 or newer to open this file. You can download the Adobe PDF Reader for free by clicking on the button below. To download a PDF version of our 16.5' wide, 6-Section Heavy DutyPneumatic Clamp Carrier Spec Sheet (1 mb), which includes specifications, electrical and air requirements, dimensions and example pricing, please click on the image to the left. 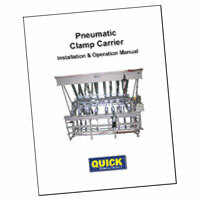 To download a PDF version of a QUICK Pneumatic 6-Section Clamp Carrier Installation/Operation manual, please visit our Manuals page by clicking on the image to the left. Be sure to check out our customers' testimonials! 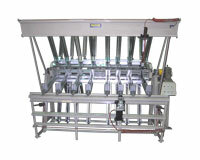 To see the machines that we currently have in stock, please click on the image to the left.